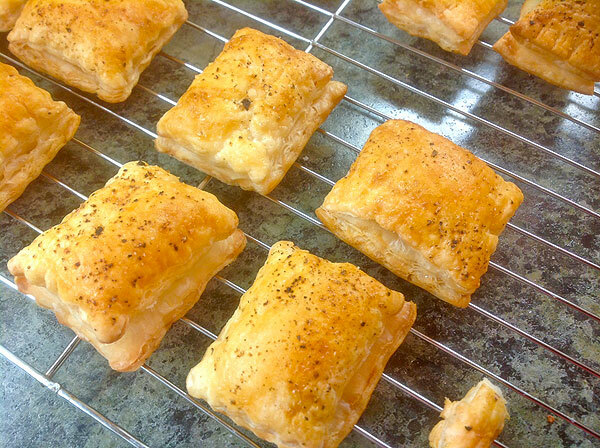 Savory puff pastry squares that are quick, simple and delicious. On lightly floured surface, roll out pastry to 16” x 10” (40 x 25 cm) rectangle. Whisk egg with 1 tbsp. of water; brush over the pastry. Sprinkle with choice of cheese (& herb, if using). Cut into squares. Place on the prepared pan. Refrigerate for about 30 minutes. Bake in the centre of the oven @ 425°F (220°C) until puffed and golden, about 10 minutes.